For those of you anticipating the report and pictures from our recent trip to Cabo, I need to apologize. I downloaded the pics from our camera a few days ago, but since then, I have unfortunately run into some issues transferring them onto the computer I use to update my blog. I should get them downloaded in the next couple of days... but until then, the wait continues. Ha ha ha! This will be just a quick little report. Yesterday, Dad and I hit the river for a few hours in the AM and early afternoon. The water levels were still on the way back down, but there was still a decent amount of flow. 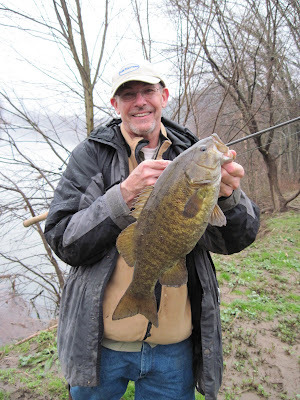 We fished the Juniata as it was in a little bit be tter shape than the Susquehanna... reading 6ft. at the Newport gauge (Susquehanna was still a bit higher). We put on some miles, and hit 6 different spots in all. We found fish at roughly half the spots we fished. All of our fish came on jigs, with various soft plastics. We didn't catch a lot but ended up with around 10-12 fish. There were a couple of nice ones, but nothing over 18 inches. The average was probably 14 inches. 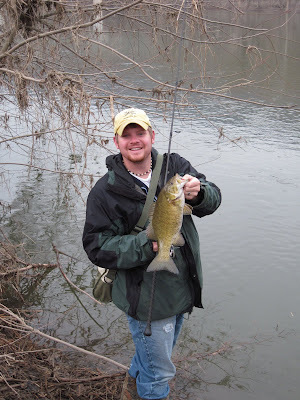 Pretty much all of the bass were close to the bank and relating in some way to slack water--either on the edge of a current break, or located in the slack water itself. Right now the bass are in their pre-spawn mode... 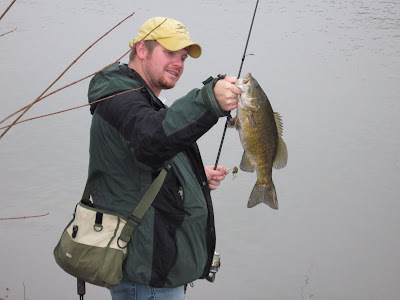 If you are interested in getting out on the river for some of the seasons fattest smallmouth, the next few weeks would be a good time to do it. Hopefully we will get some good, stable weather over the next couple weeks, and some predicable river conditions. I hope to see you out there! Nice smallies man!! awesome pics!